Starting July 9th, Bear Flag CrossFit is implementing main site programming to all our group classes. At first glance usually the biggest criticism to main site programming is the duration. Only because the workout looks simple, by no means makes it easy. “The workout is only 10 minutes coach! That is not enough for me”. Here is the short answer. Volume does not achieve quality results, intensity does. If you need any proof look at the physique of an Olympic marathoner vs Olympic decathlete. Luckily for us the original coach greg, wrote in great detail all the secrets of the crossfit programming. His greatest weapon was not in how many reps x sets he made his athletes do. It was that he made the workouts public and saw which yielded the best results over time. As the caliber of athlete got better, so did the programming. Back in the day (2009) a heavy front squat would be 135lbs, fast forward to Mondays workout at its 225lb as prescribed! Come next week I challenge you to hit just one workout a day, scaled or not. If you find yourself not being able to achieve “RX (as prescribed)”, speak to your coach about how to get better. Focus on your technique and getting great form this will not only help prevent injuries but set up foundation for the next progression. Please resist the urge to disregard the programming and slam in ‘extra work’. We are excited to see our athletes want to progress but in our professional recommendation 1 workout per day at high intensity while eating lean meats, vegetables, nuts and seads, a little fruit, some starch, and no sugar. Will yield the best results not only for fitness but achieve better health markers for your body. If you are an aspiring coach or simply want to learn more read below. CrossFit Journal on programming originally published February 2003. How effective has the programming been these last 3 months (between tests)? Is your nutrition helping or harming your results of the test? Because we believe the pursuit of fitness has a direct effect on your health markers. i.e. blood pressure, bone density, muscle mass, HDL “good cholesterol”. Is there an area of your fitness that needs some improvement, maybe it is spending more time doing the things you don’t like to do i.e endurance training, or skill progressions, or strength/stability training or flexibility. As you can see us coaches have the opportunity to now answer some big questions. But the test is only as valuable as the accuracy of the data. It is up to you to help us in keeping track of your results and upload it onto Wodify (the computer). So what does it look like!? Well to name a few here are the main requirements of the test and what they mean to us. Absolute Strength – Your child is trapped under a car, can you rescue him/her? Or can you open the jar of jelly, please? Last but not least is the scaling options. CrossFit is infinitely scalable and Test Week is no different. The scales are as follows and will be assigned to you by your coach. After all your coach is trained to best recommend which workout will be the most appropriate to keep you safe and get the most out of the test. If you have any questions or comments feel free to reach out to me at the gym or email, Joshua@bearflagcrossfit.com. Our goals at Bear Flag are to educate and inspire. Competition helps with the ‘inspire’ part: the pressure to perform pushes you to train harder; the social boost of dozens of your best friends cheering for you will help you reach a higher plane. Heck, watching your teammates GO is inspiring. Every year, CrossFit HQ runs a five-week event called “The CrossFit Open“. As always, we take the idea and make it our own. We’re not interested in finding out how fast you can exercise against 400,000 other people worldwide. We ARE interested in helping you push to new levels in fitness, level up your life, and get 1000 high fives from the Bear Flag family. We’ll divide you up into three or four teams, each with a Team Captain and a funny team name. For example; Stop Drop And Squat, Bumpers and Bacon, Pistols and PVC, Barbells and Bros, Dumbbells and Donuts, Boxers and Beers, Keep Calm and Squat On, Meaty Divas, My Pistols Are Clean. You can earn points for your team by participating (most points) winning an event (second-most points) and showing the most spirit during events(thirst most points). After five weeks of intense, novel workouts, we’ll reveal the Mystery Event Six! Our draft will happen between now and February 1. On Draft Night your name will be pulled from a hat. Unlike elementary school, EVERYONE GETS PICKED. Then the Captains work hard to get you on the bus! IF they try to recruit you before then, they’ll get a penalty..
Yep, we chose the FUN bunch to Captain, not our traditional top scorers. We want you to sign up this year; are you really going to say no to BOO? I don’t think so. This year, we’ll be using Echelon, a private scoreboard. You can also sign up for the Open at the CrossFit Games Site to check your rank worldwide. 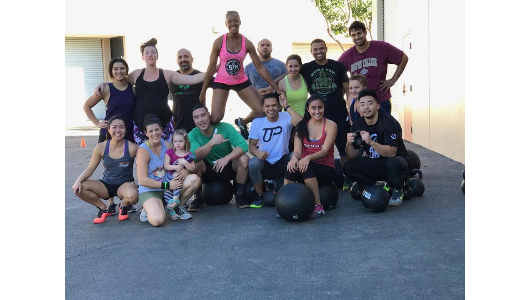 +1 Point – Attendance: every member of a team that completes an Open workout at Bear Flag each week earns one point. Maximum one point per athlete per workout. This goes for Rx AND Scaled competitors! +1 Point – Top 3: every male AND female member who places among the Top 3 at Bear Flag for each workout (Rx only) gets an extra point for their team. +5 Points (team) – Spirit: The team with the most noise, pride, and PRESENCE each week will receive 5 bonus points. Funny costumes, noisemakers, and chants all welcome! 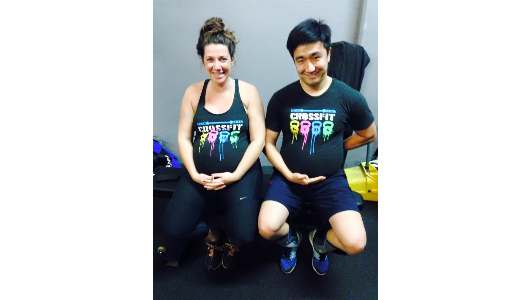 As usual, you can be tested at any CrossFit Group time on Fridays during the Open. You can just show up at any group time at Friday to test, and we usually run another test time on Saturday mornings. Your membership gets you into the tests (they’re just like regular workouts, but more challenging and fun.) The sixth event will be a freebie for anyone registered on any Intramural team. Our programming will make a slight shift for the next six weeks to get you READY for the demands of the six-week competition! We’ll have specialty programs available for those who want to improve one or two specific skills, too, and we’ll announce those by next week. In the meantime, if you’re dying to get your first toes-to-bars, or link your pull-ups, tell your coach! We’ll get you some 1:1 time and homework! The new year is creeping up on us, and with the new year comes new year’s resolutions. most people tend to set their goals related to health and fitness. think back to your 2018 health and fitness goal. did you reach it? if yes, congratulations! if you didn’t, it’s okay, we’re here to help. according to statistics, about 92% of new year’s resolutions related to weight loss or health, fail. when it comes to dieting, the key to success is sustainability. Of course, there’s no such thing as the magic diet. everyone is different. people type in “weight loss diet” on google and many pop up such as, keto, paleo, vegetarian, vegan, IIFYM, etc., all have the potential to work, but the question is, will it work for you? when it comes to finally deciding that you want to better your nutrition, our best advice is, to take it slow. when it comes to reaching any goal, you must give it time and patience. choose something that you enjoy. a good start would be to make sure your eating whole foods. if it has a long shelf-life, I would pass on it. eat good quality meats, vegetables, and healthy fats. stay away from sugary foods. excessive amounts of sugar is the leading cause to most health related problems. you don’t need to cut it out completely, rewarding yourself with your favorite treat after a long week of staying consistent, can actually be beneficial to you. don’t forget to stay active. find an activity you enjoy and play! In dedication to Michael Lopez. We got you bro.